RevK®'s rants: ASA broadband and "line rental"
I still find the line rental cost breathtakingly high. £10pcm is what you're paying A&A not what Openreach charges. So it's closer to £100 pa that ends up with Openreach. Yes that does mean a lot of ISPs are charging more than twice what they pay Openreach for "line rental" and that sort of mickey-taking is how we got to this ASA decision. I actually think £100pa is pretty good value for money for a last-mile network that covers the vast majority of the population. It's a similar cost to the periodic charges on my connections to the electricity and gas networks which likewise require a substantial team of specialist engineers to maintain. Hmm, I'm not sure you can compare it to other utility connections - as you say, it's only the last-mile network that Openretch provide, while your electric/gas charges are maintaining National Grid too. I'm certainly not begrudging A&A picking up a few quid by rounding up, as they're by *far* the cheapest copper-only offering I've seen. Plus by rounding up, it allows A&A the chance to "absorb" small price increases without having to change people's prices every quarter (or whenever Wholesale decide to increase theirs). There are other providers offering "copper lines" for £10 a month and those allow calls too - unlike A&A. Plus, A&A shouldn't have to absorb any increases as such because the cost from Openreach for the lines has only fallen, not risen in a long time. Interesting - haven't come across others (although it's been a couple of years since I searched). I admit I'd assumed that the base line price must have gone up because all the 'mainstream' phone providers (including BT) have been steadily ramping up *their* line rental for a long time. The mainstream phone providers are increasing the cost of broadband by putting it on the line rental cost (and penalising everyone without broadband). The wholesale cost has been static or decreasing for a long time. The hugely inflated line rental is exactly what ASA seem to be taking aim at now - with all the big ISPs seemed to have settled on an inflated "line rental" price of more than double the actual Openreach wholesale price, putting the difference towards artificially cheap-looking "broadband" prices and/or call bundles some customers have no use for. The ludicrous "'free' broadband! (as part of our £18 bundle)" had to be the last straw, really: it's quite blatantly a lie. RevK: "if you are really comparing solely on price (who does that?)" Many people, I suspect - after all, TalkTalk still have retail customers! It's not actually all that unreasonable, either, if you compare with the fake competition in electricity and gas supply. If I "change" my electricity "supplier", I still get exactly the same voltage down exactly the same wires from exactly the same company - only the price changes, so why choose anything other than the cheapest possible "supplier" there? For broadband it's slightly different - we all know the backhaul and transit make a big difference - but to the average customer, it probably looks very much like the "competing" ISPs are all just reselling the same BT services at slightly different prices - and indeed most of them are, just with varying levels of contention on the BT backhaul. Of course the likes of A&A and Zen invest more on that end, but how many ordinary Internet users understand that difference? Even if they have a fault, who comes out to fix it? BT (albeit branded "Openreach, a BT Group business" and officially not supposed to give you a sales pitch for BT's own retail products). Likely the wrong place to ask, but can I change my plusnet £17.99+ phone line to your £10 dry pair and everything keeps working sans the ability to call? I've made 0 calls in the last 3 years and it's stacking up! The only reason I have the line is FTTC service. Err, yes, we can just take it over. I think order form even has that as an option now. We only do the copper pair if you have the broadband with us, I assumed you do. Sadly not. I recontracted with plusnet before your new higher usage packages came into play. Broadband is stuck for a while, line is not. Ah, sorry, we price the line rental at almost cost price and hence sell only as an option with the broadband. If we sold on its own the support costs on occasional faults would make it uneconomical. When with broadband, having both with us makes support easier in many ways. Only downside for myself was had to pay to have a new line installed so I could port the number on the line to VOIP. I'm with Plusnet at present and moved my phone rental to Pulse8 - £13 per month and their call charges if you ever do make a call are way cheaper than Plusnet or BT. There's quite a few A&A customers using Pulse8 for the line rental I believe. Don't forget Plusnet will increase the monthly broadband by £2.50 if your phone isn't with them. I have Plusnet line rental and A&A broadband but only pay them £11.04pcm. When in 2013 they bought out YourCalls.net, to whom I used to pay only £9.44, Plusnet honoured current contracts and actually charged me a bit less - £9.00. I expected they'd start charging me full price after a year but the price never changed until recently, and then only rose by the amount of their price increase. They don't ordinarily allow phone line without the broadband either. Still, good to know that should the discount ever be removed in future I'm likely to have the option of porting my number to Voip with A&A. You mean if I switch my line from BT to Plusnet (who already provide the internet service) I get £2.50 off? I want to dump BT but keep Plusnet - a lot of providers won't let me. I'm actually quite excited about porting my land-line number to VOIP but that's just me. I hope you get it sorted soon, I've volunteered as a tester and I've identified the equipment that I'll need at my end, just haven't bought it yet. "All my base are yours"
Ha, well, at least we allow you to mix'n'match whatever you want pretty easily. Porting is still at the head-against-brick-wall stage with Openreach, but we confirmed it "should work". One way to solve this could be to entirely separate phone service, broadband, and line rental. Bundling introduces complexity when one company tries to blame another (e.g. A&A vs Openzone) when fault finding. With clear demarcation of service boundaries, it would be easier to problems resolved when there is less incentive for collusion and more onus on happy customers. The same principle would apply to FTTP. The main difference is that a phone service can share a line with an internet service with a copper pair, but not easily with fibre. Since the transition to fibre is hopefully inevitable, any existing land lines should be transitioned to voip services now to make switching from copper to fibre, or just changing isp, easier (when changing from a copper to copper isp, there is no risk of losing phone service or vice versa). I'm glad it's not only me. My first thought when I heard this on the radio this morning was "but I only want the internet, I've already got a line". I forsee great confusion. 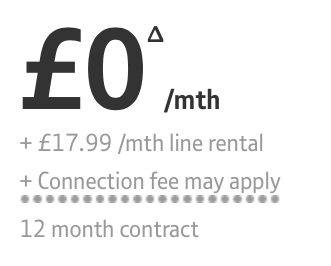 It becomes more challenging with providers that let you mix and match (like A&A), but the target is mass-market providers like TalkTalk, BT et al, where the "line rental" is a compulsory surcharge. You cannot buy any service from BT or TalkTalk unless you buy line rental from them to act as a baseline. Thus, if I have line rental from A&A, *BT* will refuse to sell me a calls package or broadband to add to that line. It's this practice that the ASA is trying to bar - I think that you're still in the spirit of the recommendation as long as the price you advertise is a price I can pay if I don't want to move other services to you. Thus, £25 for Home::1 is fair - that's your charge for the broadband component, and you won't stop me taking line rental from someone else. Advertising £10 line rental would not be fair - you won't actually sell me just a line at that price; however, you could advertise Home::1 as £35 including the copper pair. Similarly, if I offered my MPF service as £17.99 line rental, ADSL2+ for free, or my SMPF service as £10/month for ADSL2+, it'd be reasonable to describe the broadband as £10/month, *or* the bundle of line and BB as £17.99/month. It would not be reasonable under the ASA ruling to describe the broadband as free. There's a lot to be said for the Japanese system where you pay NTT East or West directly for the physical infrastructure, all copper, hybrid or all fibre, then pay your chosen provider for Internet access. rev you dont need to quote landline costs in your price when its optional.